Yavapai County, Arizona, is a dusty ol’ hamlet inhabited by a lot of Native Americans. A Police Deputy named Rusty (Harmstorf) is an angry, corrupt racist who is working with drug-dealing biker gangs when he’s not verbally abusing the local Indian population. So he really doesn’t approve when Thunder (Gregory), a big, muscular, and incorruptible local Indian joins the police force. Now caught between Thunder and Sheriff Roger (Svenson), Rusty plants some drugs in Thunder’s locker at the police station. Thunder then undergoes some brutal hardships at the local prison, biding his time until he can get out and take revenge on those who wronged him. Rusty and his cronies better prepare for the oncoming THUNDER STORM! In the grand tradition of “persecuted Indians on the run but with some revenge” movies such as Johnny Firecloud (1975) and Tell Them Willie Boy Is Here (1969) comes Thunder Warrior 2 - or, to make things a bit more simple, just take First Blood (1982) and make Rambo an Indian. The fact that there are THREE Thunder Warrior movies is a testament to the video store era, when stores clamored for product to fill its shelves, and Italian companies (and so many others) were more than happy to oblige. Shot in the American west by a team of Italians, led by Fabrizio DeAngelis (under his normal pseudonym Larry Ludman), It has that certain Italian feel we all know and love. 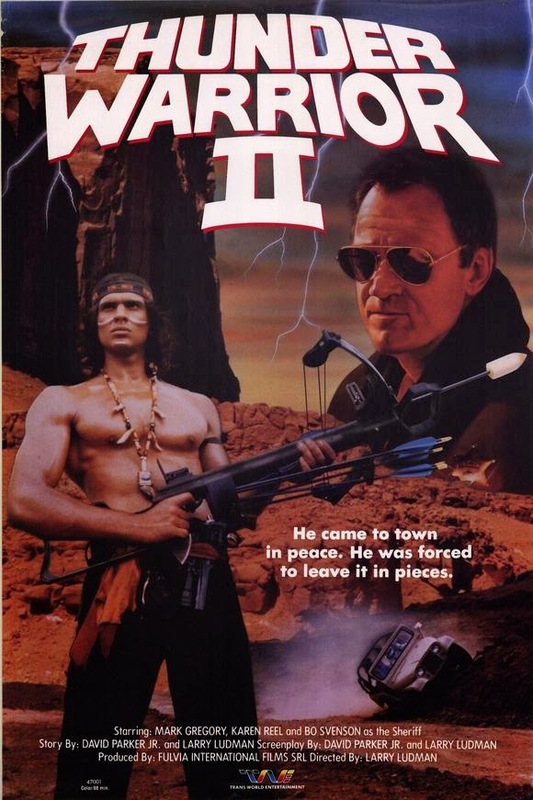 Maybe it’s the dubbing, maybe it’s hiring Mark Gregory - Trash himself - as an American Indian, or maybe some other indefinable quality, but a work like Thunder Warrior 2 could only have come from those mad Italian geniuses. They get very impressive scenery on film, maybe it’s the outsider’s view of America. We can’t be sure it’s an in-joke, but at one point a character says to Thunder, “This ain’t no place for trash like you!” - could that be a reference video junkies at the time (and today) are meant to recognize? Also in the noteworthy dialogue department, Rusty is blatantly called “The most corrupt in Arizona”! Well at least he isn’t trying to hide it. Raimund Harmstorf, who plays Rusty, was an actor the Italians used often when they needed a blonde, blue-eyed guy for a change. He was a shoe-in to play the evil racist. Maybe it’s his name, “Rusty”, but in this movie at least, he has a certain Chuck Norris-esque quality. Thunder Warrior 2 has a good amount of action scenes, and most of them, including the stunts and car chases/crashes, are in slow motion. This predating Hard Target (1993) by many years. Plus who can forget the heart-stopping “Thunder on a rope” sequence? And like how many people, when they’re about to get revenge, put on a special “revenge outfit” (the best example being Lawrence Hilton-Jacobs in Quietfire), Thunder goes full-on Indian regalia before he breaks out the bow and arrow with missile-tipped arrows! Granted, they look a lot like lipstick tubes, but so what? Plus, other characters just casually call this hulking brute “Thunder”, as in, “hey Thunder, what’s goin’ on?” - his name is THUNDER, okay? THUNDER. Show the proper amount of awe. 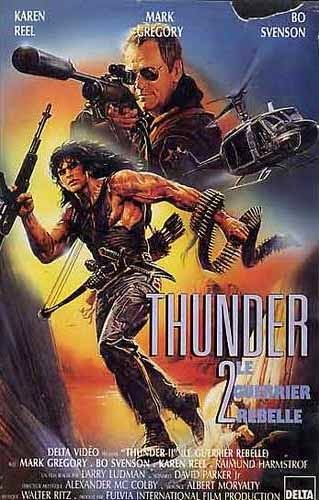 Released by TransWorld in one of their standard big-boxes (you gotta love the original retail price of $79.95 printed on the sleeve), Thunder Warrior 2 was the middle half of a Thunder sandwich (also a great name for this movie) and we think you pretty much know what to expect. Damn, I've got all three of these flicks sitting on my DVD pile. Must get around to watching them. A solid action movie, but not the classic the first one was. The third Thunder movie was the least of the franchise. I always wondered why these movies are called Thunder in Europe and Thunder Warrior in the USA. Jack: Definitely worth watching for the Mark Gregory factor. We only had Part 2 available. Would love to see the 1st and 3rd. Roger: Always wanted to see the 1st one. Will have to buy it one day. Good question about the titles. Both work. The USA is always something generic sounding. Haha. You can get part 1 on a dvd compilation with Caged Fury and Savage Dawn, though oddly on the DVD case the film is called "Drug Traffikers" for some reason. Thanks for the heads-up! Appreciate it. It would be the coolest thing. Trying to do that now. Have three posters in our house: Man Of Tai Chi, Cobra, and Punisher War Zone hanging right next to each other. Haha. "Ain't no place for Trash like you" is an obvious reference to the Bronx Warriors movies where Gregory played a character literally named Trash. That's interesting they referenced the Bronx Warriors.